Arbrook Land offers its investors and joint venture partners a comprehensive and inclusive approach to property development. 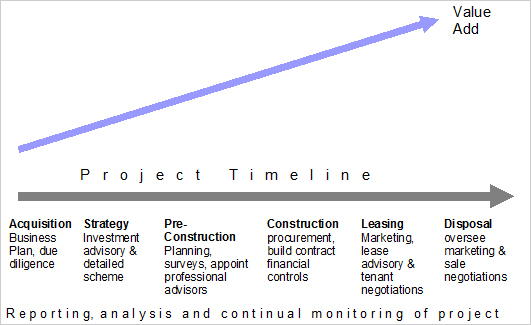 We are actively and energetically involved in every stage of the development cycle, from identifying an investment opportunity / development angle through to the strategy, acquisition, build contract, letting, and ultimately the sale of the completed asset. Our thorough and detailed approach ensures our schemes achieve optimum development value and the strongest possible returns for our investors. Detailed financial appraisals, comprehensive strategy and business plans, and constant project monitoring form a key part of our approach. We work with a wide variety of property professionals, including architects, planning advisors, commercial and residential agents, project managers and cost consultants. Many of these advisors have worked with us successfully on numerous projects before, and we have developed strong working relationships, enabling us to quickly assemble the appropriate team tailored for each individual project. Arbrook Land offers its investors and joint venture partners a comprehensive and inclusive approach to property development.